BlueThroat project is the only opensource solution for migrating your infrastructure to the cloud. This article supplements a webinar series on doing CI/CD with Kubernetes. The series discusses how to take a cloud native approach to building, testing, and deploying applications, covering release management, cloud native tools, service meshes, and CI/CD tools that can be used with Kubernetes. It is designed to help developers and businesses that are interested in integrating CI/CD best practices with Kubernetes into their workflows. This tutorial includes the concepts and commands from the last session of the series, GitOps Tool Sets on Kubernetes with CircleCI and Argo CD. Warning: The procedures in this tutorial are meant for demonstration purposes only. As a result, they don’t follow the best practices and security measures necessary for a production-ready deployment. Using Kubernetes to deploy your application can provide significant infrastructural advantages, such as flexible scaling, management of distributed components, and control over different versions of your application. However, with the increased control comes an increased complexity that can make CI/CD systems of cooperative code development, version control, change logging, and automated deployment and rollback particularly difficult to manage manually. To account for these difficulties, DevOps engineers have developed several methods of Kubernetes CI/CD automation, including the system of tooling and best practices called GitOps. GitOps, as proposed by Weaveworks in a 2017 blog post, uses Git as a “single source of truth” for CI/CD processes, integrating code changes in a single, shared repository per project and using pull requests to manage infrastructure and deployment. There are many tools that use Git as a focal point for DevOps processes on Kubernetes, including Gitkube developed by Hasura, Flux by Weaveworks, and Jenkins X, the topic of the second webinar in this series. 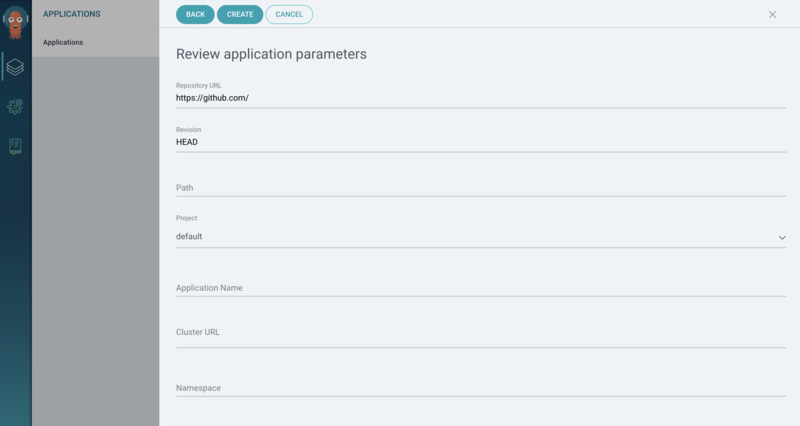 In this tutorial, you will run through a demonstration of two additional tools that you can use to set up your own cloud-based GitOps CI/CD system: The Continuous Integration tool CircleCI and Argo CD, a declarative Continuous Delivery tool. CircleCI uses GitHub or Bitbucket repositories to organize application development and to automate building and testing on Kubernetes. By integrating with the Git repository, CircleCI projects can detect when a change is made to the application code and automatically test it, sending notifications of the change and the results of testing over email or other communication tools like Slack. CircleCI keeps logs of all these changes and test results, and the browser-based interface allows users to monitor the testing in real time, so that a team always knows the status of their project. 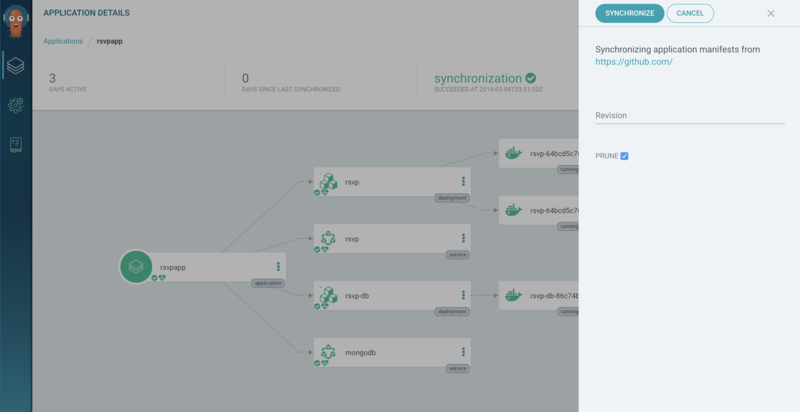 As a sub-project of the Argo workflow management engine for Kubernetes, Argo CD provides Continuous Delivery tooling that automatically synchronizes and deploys your application whenever a change is made in your GitHub repository. By managing the deployment and lifecycle of an application, it provides solutions for version control, configurations, and application definitions in Kubernetes environments, organizing complex data with an easy-to-understand user interface. It can handle several types of Kubernetes manifests, including ksonnet applications, Kustomize applications, Helm charts, and YAML/json files, and supports webhook notifications from GitHub, GitLab, and Bitbucket. Setting up pipeline triggers to automate application testing with CircleCI and GitHub. Synchronizing and deploying an application from a GitHub repository with Argo CD. By the end of this tutorial, you will have a basic understanding of how to construct a CI/CD pipeline on Kubernetes with a GitOps tool set. An Ubuntu 16.04 server with 16 GB of RAM or above. Since this tutorial is meant for demonstration purposes only, commands are run from the root account. Note that the unrestrained privileges of this account do not adhere to production-ready best practices and could affect your system. For this reason, it is suggested to follow these steps in a test environment such as a virtual machine or a DigitalOcean Droplet. A Docker Hub Account. For an overview on getting started with Docker Hub, please see these instructions. A GitHub account and basic knowledge of GitHub. For a primer on how to use GitHub, check out our How To Create a Pull Request on GitHub tutorial. Familiarity with Kubernetes concepts. Please refer to the article An Introduction to Kubernetes for more details. A Kubernetes cluster with the kubectl command line tool. This tutorial has been tested on a simulated Kubernetes cluster, set up in a local environment with Minikube, a program that allows you to try out Kubernetes tools on your own machine without having to set up a true Kubernetes cluster. To create a Minikube cluster, follow Step 1 of the second webinar in this series, Kubernetes Package Management with Helm and CI/CD with Jenkins X. In this step, you will put together a standard CircleCI workflow that involves three jobs: testing code, building an image, and pushing that image to Docker Hub. In the testing phase, CircleCI will use pytest to test the code for a sample RSVP application. Then, it will build the image of the application code and push the image to DockerHub. Entering your username and password here gives CircleCI the permission to read your GitHub email address, deploy keys and add service hooks to your repository, create a list of your repositories, and add an SSH key to your GitHub account. These permissions are necessary for CircleCI to monitor and react to changes in your Git repository. 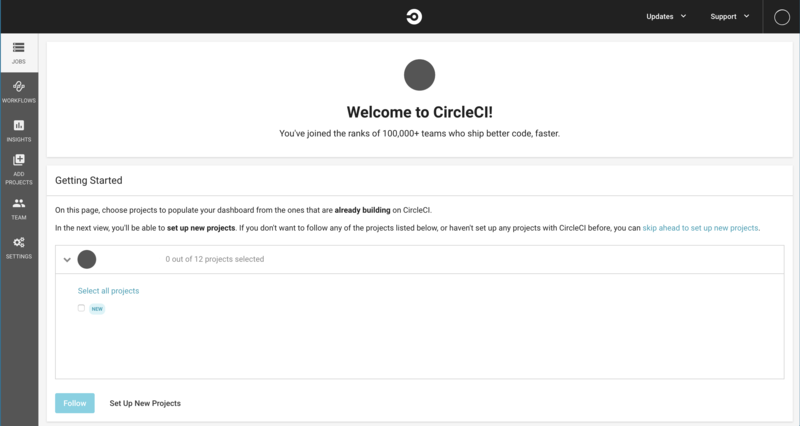 If you would like to read more about the requested permissions before giving CircleCI your account information, see the CircleCI documentation. Now that you have access to your CircleCI dashboard, open up another browser window and navigate to the GitHub repository for this webinar, https://github.com/do-community/rsvpapp-webinar4. If prompted to sign in to GitHub, enter your username and password. In this repository, you will find a sample RSVP application created by the CloudYuga team. For the purposes of this tutorial, you will use this application to demonstrate a GitOps workflow. Fork this repository to your GitHub account by clicking the Fork button at the top right of the screen. When you’ve forked the repository, GitHub will redirect you to https://github.com/your_GitHub_username/rsvpapp-webinar4. On the left side of the screen, you will see a Branch: master button. Click this button to reveal the list of branches for this project. Here, the master branch refers to the current official version of the application. On the other hand, the dev branch is a development sandbox, where you can test changes before promoting them to the official version in the master branch. Select the dev branch. Now that you are in the development section of this demonstration repository, you can start setting up a pipeline. CircleCI requires a YAML configuration file in the repository that describes the steps it needs to take to test your application. The repository you forked already has this file at .circleci/config.yml; in order to practice setting up CircleCI, delete this file and make your own. version: 2 jobs:   test:     machine:       image: circleci/classic:201808-01       docker_layer_caching: true     working_directory: ~/repo  . . . In the preceding code, version refers to the version of CircleCI that you will use. jobs:test: means that you are setting up a test for your application, and machine:image: indicates where CircleCI will do the testing, in this case a virtual machine based on the circleci/classic:201808-01 image.
. . .     steps:       - checkout       - run:           name: install dependencies           command: |             sudo rm /var/lib/dpkg/lock             sudo dpkg --configure -a             sudo apt-get install software-properties-common             sudo add-apt-repository ppa:fkrull/deadsnakes             sudo apt-get update             sleep 5             sudo rm /var/lib/dpkg/lock             sudo dpkg --configure -a             sudo apt-get install python3.5             sleep 5             python -m pip install -r requirements.txt        # run tests! # this example uses Django's built-in test-runner       # other common Python testing frameworks include pytest and nose       # https://pytest.org       # https://nose.readthedocs.io        - run:           name: run tests           command: |             python -m pytest tests/test_rsvpapp.py    . . . The steps of the test are listed out after steps:, starting with - checkout, which will checkout your project’s source code and copy it into the job’s space. Next, the - run: name: install dependencies step runs the listed commands to install the dependencies required for the test. In this case, you will be using the Django Web framework’s built-in test-runner and the testing tool pytest. After CircleCI downloads these dependencies, the -run: name: run tests step will instruct CircleCI to run the tests on your application.
. . .   build:      machine:       image: circleci/classic:201808-01       docker_layer_caching: true     working_directory: ~/repo      steps:       - checkout        - run:           name: build image           command: |             docker build -t $  DOCKERHUB_USERNAME/rsvpapp:$  CIRCLE_SHA1 . push:     machine:       image: circleci/classic:201808-01       docker_layer_caching: true     working_directory: ~/repo     steps:       - checkout        - run:           name: Push image           command: |             docker build -t $  DOCKERHUB_USERNAME/rsvpapp:$  CIRCLE_SHA1 . echo $  DOCKERHUB_PASSWORD | docker login --username $  DOCKERHUB_USERNAME --password-stdin             docker push $  DOCKERHUB_USERNAME/rsvpapp:$  CIRCLE_SHA1      . . .
As before, machine:image: means that CircleCI will build the application in a virtual machine based on the specified image. Under steps:, you will find - checkout again, followed by - run: name: build image. This means that CircleCi will build a Docker container from the rsvpapp image in your Docker Hub repository. You will set the $ DOCKERHUB_USERNAME environment variable in the CircleCI interface, which the tutorial will cover after this YAML file is complete. After the build job is done, the push job will push the resulting image to your Docker Hub account. These lines ensure that CircleCI executes the test, build, and push jobs in the correct order. context: DOCKERHUB refers to the context in which the test will take place. You will create this context after finalizing this YAML file. The only: dev line restrains the workflow to trigger only when there is a change to the dev branch of your repository, and ensures that CircleCI will build and test the code from dev. Once you have added this file to the dev branch of your repository, return to the CircleCI dashboard. CircleCI will then ask you for the name of this context. Enter DOCKERHUB, then click Create. 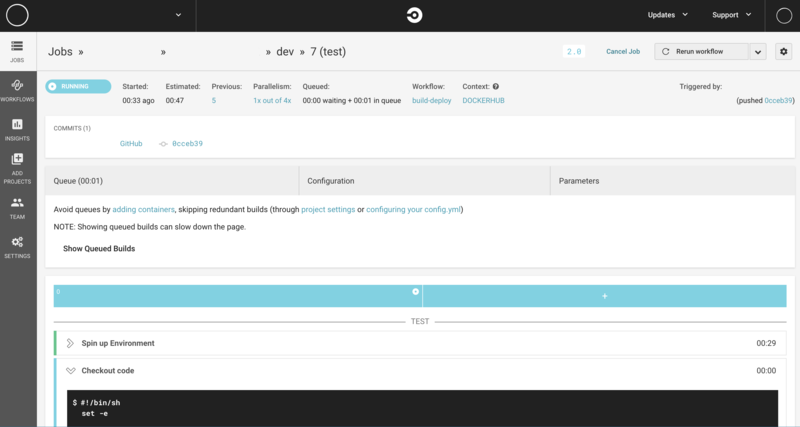 Once you have created the context, select the DOCKERHUB context and click the Add Environment Variable button. For the first, type in the name DOCKERHUB_USERNAME, and in the Value enter your Docker Hub username. 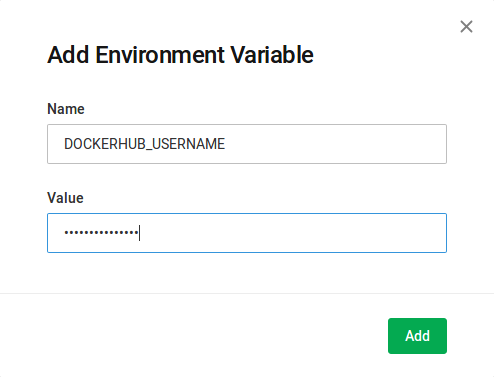 Then add another environment variable, but this time, name it DOCKERHUB_PASSWORD and fill in the Value field with your Docker Hub password. When you’ve create the two environment variables for your DOCKERHUB context, create a CircleCI project for the test RSVP application. To do this, select the ADD PROJECTS button from the left-hand side menu. This will yield a list of GitHub projects tied to your account. Select rsvpapp-webinar4 from the list and click the Set Up Project button. Note: If rsvpapp-webinar4 does not show up in the list, reload the CircleCI page. Sometimes it can take a moment for the GitHub projects to show up in the CircleCI interface. 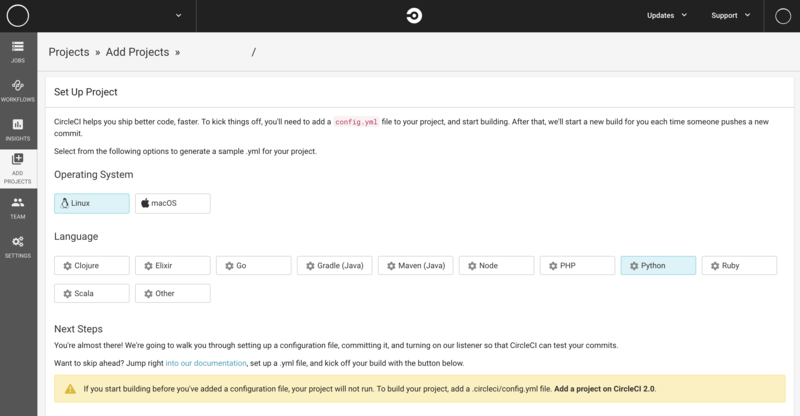 At the top of the screen, CircleCI instructs you to create a config.yml file. Since you have already done this, scroll down to find the Start Building button on the right side of the page. By selecting this, you will tell CircleCI to start monitoring your application for changes. Click on the Start Building button. CircleCI will redirect you to a build progress/status page, which as yet has no build. 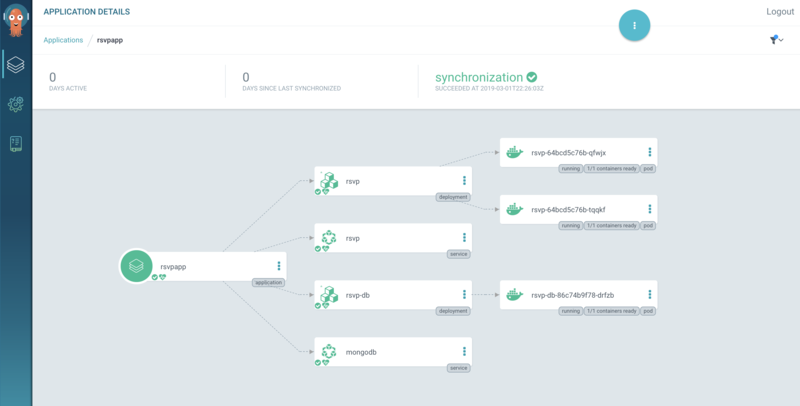 With your CircleCI workflow taking care of the Continuous Integration aspect of your GitOps CI/CD system, you can install and configure Argo CD on top of your Kubernetes cluster to address Continuous Deployment. Just as CircleCI uses GitHub to trigger automated testing on changes to source code, Argo CD connects your Kubernetes cluster into your GitHub repository to listen for changes and to automatically deploy the updated application. To set this up, you must first install Argo CD into your cluster. Within this namespace, Argo CD will run all the services and resources it needs to create its Continuous Deployment workflow. In this command, the -n flag directs kubectl to apply the manifest to the namespace argocd, and -f specifies the file name for the manifest that it will apply, in this case the one downloaded from the Argo repository. Once you run the port-forward command, your command prompt will disappear from your terminal. To enter more commands for your Kubernetes cluster, open a new terminal window and log onto your remote server. Now that you have installed Argo CD and exposed its server to your local workstation, you can continue to the next step, in which you will connect GitHub into your Argo CD service. To allow Argo CD to listen to GitHub and synchronize deployments to your repository, you first have to connect Argo CD into GitHub. To do this, log into Argo. WARNING: server certificate had error: x509: certificate signed by unknown authority. Proceed insecurely (y/n)? If you were deploying an application on a cluster external to the Argo CD cluster, you would need to register the application cluster’s credentials with Argo CD. If, as is the case with this tutorial, Argo CD and your application are on the same cluster, then you will use https://kubernetes.default.svc as the Kubernetes API server when connecting Argo CD to your application. In the field for Repository URL, enter https://github.com/your_GitHub_username/rsvpapp-webinar4, then enter your GitHub username and password. Once you’ve entered your credentials, click the CONNECT button at the top of the screen. The Path field designates where the YAML file for your application resides in your GitHub repository. For this project, type k8s. For Application Name, type rsvpapp, and for Cluster URL, select https://kubernetes.default.svc from the dropdown menu, since Argo CD and your application are on the same Kubernetes cluster. Finally, enter default for Namespace. After Status:, you will see that your application is OutOfSync with your GitHub repository. To deploy your application as it is on GitHub, click ACTIONS and choose Sync. After a few moments, your application status will change to Synced, meaning that Argo CD has deployed your application. Now that you have deployed your application using Argo CD, you can test your Continuous Deployment system and adjust it to automatically sync with GitHub. With Argo CD set up, test out your Continuous Deployment system by making a change in your project and triggering a new build of your application. 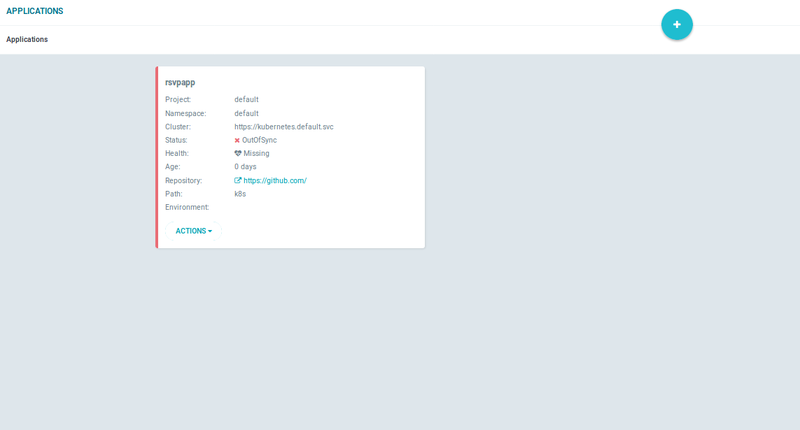 apiVersion: apps/v1 kind: Deployment metadata:   name: rsvp spec:   replicas: 2   selector:     matchLabels:       app: rsvp   template:     metadata:       labels:         app: rsvp     spec:       containers:       - name: rsvp-app         image: nkhare/rsvpapp: dev         imagePullPolicy: Always         livenessProbe:           httpGet:             path: /             port: 5000           periodSeconds: 30           timeoutSeconds: 1           initialDelaySeconds: 50         env:         - name: MONGODB_HOST           value: mongodb         ports:         - containerPort: 5000           name: web-port . . . Instead of pulling the original image from Docker Hub, Argo CD will now use the dev image created in the Continuous Integration system to build the application. Commit the change, then return to the ArgoCD UI. You will notice that nothing has changed yet; this is because you have not activated automatic synchronization and must sync the application manually. Clicking this checkbox will ensure that, once Argo CD spins up your new application, it will destroy the outdated version. Click the PRUNE box, then click SYNCHRONIZE at the top of the screen. You will see the old elements of your application spinning down, and the new ones spinning up with your CircleCI-made image. If the new image included any changes, you would find these new changes reflected in your application at the URL your_remote_server_IP_address:app_port_number. To make sure that revisions are not accidentally deleted, the default for automated sync has prune turned off. To turn automated pruning on, simply add the --auto-prune flag at the end of the preceding command. 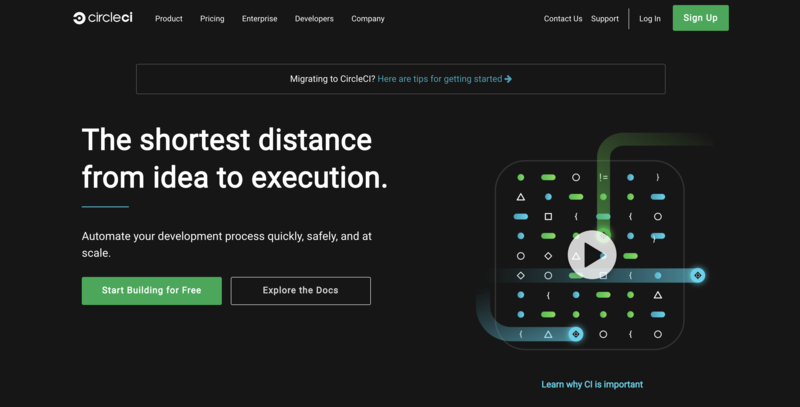 Now that you have added Continuous Deployment capabilities to your Kubernetes cluster, you have completed the demonstration GitOps CI/CD system with CircleCI and Argo CD. In this tutorial, you created a pipeline with CircleCI that triggers tests and builds updated images when you change code in your GitHub repository. You also used Argo CD to deploy an application, automatically incorporating the changes integrated by CircleCI. 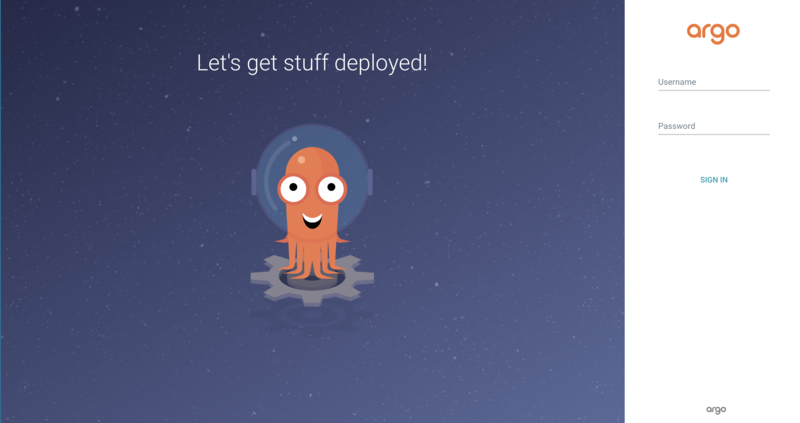 You can now use these tools to create your own GitOps CI/CD system that uses Git as its organizing theme. If you’d like to learn more about Git, check out our An Introduction to Open Source series of tutorials. To explore more DevOps tools that integrate with Git repositories, take a look at How To Install and Configure GitLab on Ubuntu 18.04. Let’s say you want to distribute a Python tool with docker using known good dependency versions ready to be used by end users… In this article you will see how to continuously keeping up to date a Docker Hub container with minimal managing effort (because I’m a lazy guy) using github, TravisCI and pyup. The goal was to reduce as much as possible any manual activity for updates, check all works fine before pushing, minimize build times and keep docker container always secure and updated with a final high quality confidence. The docker build/publish stuff lives on another repository, so https://github.com/davidemoro/pytest-play-docker is the repository that implements the Docker releasing workflow for https://github.com/pytest-dev/pytest-play on Docker Hub (https://hub.docker.com/r/davidemoro/pytest-play). a new pytest-play version or any other pinned sub-dependency is published on PyPI. By the way pytest-play is automatically released on PyPI thanks to travis when a new tag comes on the master branch. All tests executions run against the docker build so there is a warranty that what is pushed to Docker Hub works fine (it doesn’t check only that the build was successful but it runs integration tests against the docker build), so no versions incompatibilities, no integration issues between all the integrated third party pytest-play plugins and no issues due to the operative system integration (e.g., I recently experienced an issue on alpine linux with a pip install psycopg2-binary that apparently worked fine but if you try to import psycopg2 inside your code you get an unexpected import error due to a recent issue reported here https://github.com/psycopg/psycopg2/issues/684). you know what was the workflow for every automated docker push for pytest-play. Many thanks to Andrea Ratto for the 10 minutes travis build speedup due to Docker cache, from ~11 minutes to ~1 minute is a huge improvement indeed! It was possible thanks to the docker pull davidemoro/pytest-play command, the build with the –cache-from davidemoro/pytest-play option and running the longest steps in a separate and cacheable step (e.g., the very very long cassandra-driver compilation moved to requirements_cassandra.txt will be executed only if necessary). Relevant technical details about pytest-play-docker follows (some minor optimizations are still possible saving in terms of final size). – travis_wait 25 docker build –cache-from “$ IMAGE_NAME:latest” -t “$ IMAGE_NAME” . Any feedback will be always appreciated. I’ve built a new Exploratory Data Analysis tool, I used it in a few presentations last year with the code on github and have now (finally) published it to PyPI. The goal is to quickly check in a DataFrame using machine learning (sklearn’s Random Forests) if any column predicts any other column. I’m interested in the question “what relationships exist in my data” – particularly if I’m working in an unknown domain and on new data. I’ve used this on client projects during the discovery phase to learn more about the sort of questions I should ask a client. The GitHub Readme includes a screenshot which will give you an idea using the Titanic classification and Boston regression examples. This is a very light project at the moment, I think the idea has value, I’m very open to feedback. The post “discover feature relationships” – new EDA tool appeared first on Entrepreneurial Geekiness.